One of the great things about nature is that it is so full of surprises. No matter how long you've studied natural history, no matter how many times you've visited a particular wildlife locale, there's always something new to see or learn. Over the past two decades we've walked the trails at Hilton Pond Center thousands of times, but there's never a day that we don't see something of interest, never a week we don't encounter at least one plant or animal we hadn't spotted before. Usually, we have some idea of what a new discovery might be, but this week we came across something unique and exciting that had us stumped. 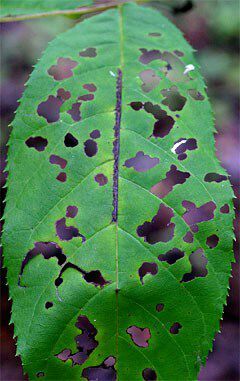 As we traversed a path on the dam that forms Hilton Pond, we noticed several bright white clumps on the undersides of leaves of a two-foot Black Walnut sapling that was standing alone in semi-shade beneath a loose canopy of Sweetgum. The snowy objects contrasted sharply against the walnut's deep green leaves (below right); the finding piqued our interest, so we stopped for a closer examination. What we found were long, lacy threads of a very soft material that moved with the slightest breeze and that practically disintegrated at our touch. As we watched, the snowy clumps began to glide along under the leaves, and when they turned just right we could see six tiny legs (above) that led us to believe the white stuff was somehow attached to the larval stage of an insect. Each organism's abdomen also had seven pairs of what looked like "prolegs"--the false feet used as claspers by caterpillars, so that's what we assumed the creatures must be. After making all our observations, we still had no idea what we had actually encountered. As we searched our mental database, we remembered seeing similar white filamentous flocculence long ago on another animal--a Wooly Aphid that was sucking juice from the leaf of an herbaceous plant. Our new discovery obviously was not an aphid--a tiny insect scarcely an eighth of an inch long--so we did what inquisitive naturalists have done for centuries: We walked back to the Center's library and went page by page through every book we had on caterpillars--i.e., the larvae of butterflies and moths--looking for a photo that matched what we had seen on the trail. Unfortunately, no match was found, so then we did what any tech-savvy 21st century naturalist now does: We powered up our computer, went on-line, and headed straight for the Google search engine Web site. Used properly, search engines are wonderful tools that allow almost instant access to sources that might have taken months to find on inter-library loan. We went to work on Google, keying in various combinations of words to see if we could find a reference to help us identify our caterpillars on the Black Walnut leaves. We looked for "fluffy caterpillar," "fuzzy caterpillar," "downy caterpillar," "white caterpillar," and "caterpillar" with a number of other adjectives prefixed, but repeatedly came up with nothing applicable. 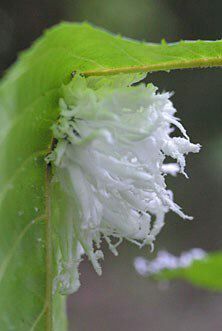 Then, remembering our previous sighting of the Wooly Aphid covered in white stuff, we tried "Wooly caterpillar" and, of course, got hundreds of discussions on the weather-forecasting abilities of the common "Wooly Bear Caterpillar." 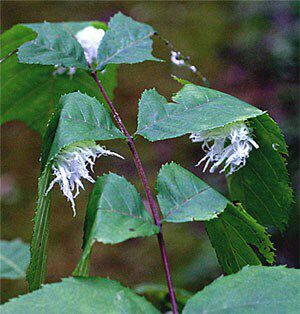 Taking a different tack, we then tried "caterpillar" and "Black Walnut," only to learn that the Walnut Caterpillar is hairy and not covered with snowy fluff. Closer scrutiny of the Butternut Woolyworm Web site revealed we had made a critical error at the very beginning of our investigation: The woolyworm is the larva of a sawfly--not of a moth or butterfly--so our discovery wasn't a caterpillar at all, but a grub! Unlike caterpillars-- which typically have five pairs of prolegs--most sawfly larvae have seven pairs. Had we known this tidbit we could have narrowed our search from the beginning. Another clarification: Sawflies aren't really flies--which have one pair of wings--but are in a diverse suborder of the Hymenoptera, a large group that includes four-winged insects such as bees, wasps, and ants. 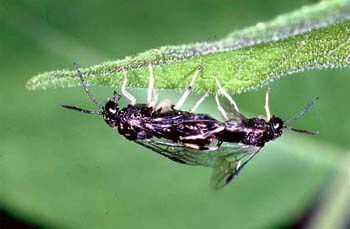 The female sawfly has a well-developed ovipositor that she uses to insert eggs into leaves and twigs, and some sawfly species bear ovipositors with serrated, saw-like edges--hence their name. The Butternut Woolyworm Sawfly, Eriocampa juglandis, is a shiny little black insect with white legs and bulbous eyes; females are about three- eighths of an inch long, and males are about a third smaller (above right). After copulation (depicted in the photo), the female usually finds an acceptable leaflet on a Butternut tree, Juglans cinerea, which happens to be in the same family (Juglandaceae) as hickories and the closely related Black Walnut, J. nigra. All these have large compound leaves subdivided into many smaller leaflets. Butternuts occur regularly from Tennessee northward to the Canadian border, so that's where the Butternut Woolyworm Sawfly is usually found. In recent decades, however, the sawfly apparently has extended its range southward, and in the Carolina Piedmont females oviposit primarily on Black Walnut trees that already had a more southerly distribution than Butternuts. The female sawfly often lays her eggs right on the midrib of the walnut leaflet, resulting in a weak spot. 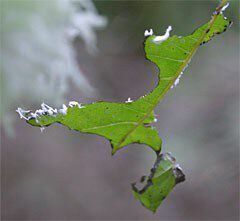 In about a week her larvae hatch out, begin eating their way around the leaflet (above left), and start producing the waxy material that becomes their downy coat of white. As the sawfly larvae grow, they molt, leaving behind the old skin and attached white stuff that is quickly replaced. The increasing mass of the larvae causes the leaflets to fold (below right)--right at the spot where the female sawfly laid her eggs; flap-leaved walnuts are another tell-tale sign that Butternut Woolyworms are in the neighborhood. Host trees may be defoliated by periodic outbreaks of sawfly larvae, but both Butternuts and Black Walnuts appear to rebound from occasional infestations--even if they might look a little unsightly for a while. By mid-summer Butternut Woolyworms reach their optimal size, crawl earthward, and enter the soil. There each larva forms a cocoon in which it develops through the fall and winter, finally emerging early the following spring as an adult sawfly that helps start the cycle anew. We suspect the Butternut Woolyworms we found at the Center are about as big as they're going to get, so we won't be surprised in the next week or two to find them missing from the Black Walnut sapling. If we dig around beneath the little tree, we may even find a cocoon or two. Even though we--and you--can now identify a Butternut Woolyworm. there's still something mysterious about these creatures. 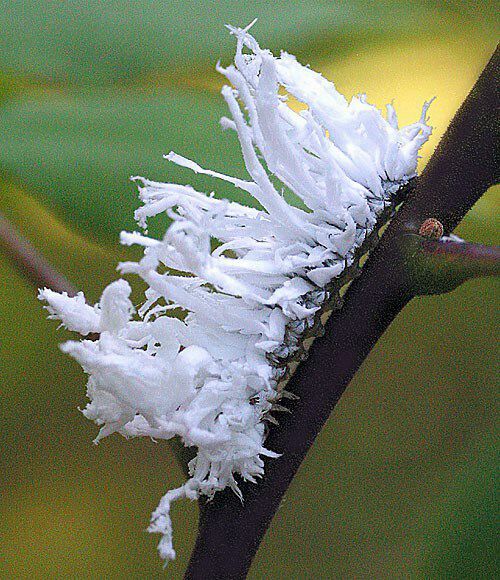 As obvious as sawfly larvae are with their lacy white outfits, why is it that something hasn't discovered and devoured them? Our guess is that the waxy, filamentous flocculence that attracted our attention in the first place is less than tasty to predators, and that Butternut Woolyworms just don't have much to worry about as they nibble away at the leaves of walnut trees on the banks of Hilton Pond. In 2003, informative and entertaining hummingbird banding presentations are scheduled at locations in South Carolina, Kentucky/Tennessee & Virginia. --Two Ruby-throated Humingbirds were banded on 12 Jul--the first new RTHUs since 'way back on 8 Jun. The birds, both females were also the first juvenile RTHUs of the season at Hilton Pond Center. The first young male was trapped on 13 Jul. --We also had seven interesting returns of banded Ruby-throated Hummingbirds, including two females originally captured in 1999. One has returned every year since, while the other--banded as an adult on 5 Aug 1999--was not seen again until this week; this bird is more than five years old and is the second RTHU retrapped this year at Hilton Pond Center after not being caught since 1999. This is the first year we've ever had RTHUs go that long between original banding and first recapture. --While opening mist nets early on the morning of 14 Jul, we practically bumped into a White- tailed Deer fawn that was also walking the trail. Its fresh-looking, heavily spotted pelt indicated it was probably just a few days old. After moving to Hilton Pond Center in 1982, we saw no deer for more than a decade, but in the past five years they have become increasingly common--including the rare piebald (calico) individual that appeared at the Center on Christmas Day 2002. --On a net check a few hours after seeing the fawn, we heard a Wild Turkey calling from the edge of a small meadow south of Hilton Pond. These, too, were not observed at the Center until the past few years. Some wildlife biologists believe there are more deer and turkey in the Carolina Piedmont than ever before.